With the latest “Polar Vortex” or whatever that is happening, EVERYONE is talking about the weather. Everyone always talks about how it has been this cold many times, etc, etc. “It was colder in my day” – ok. Well prove it! I downloaded the CSV, opened in Excel 2013 and imported into Power Query. I think did some formatting to get the date parts and a date field, and converted the “tenths of a degree of Celsius” to Fahrenheit. Then started analyzing. I will have to refresh this after this cold spell, because it only has data to 1/1/2014 and these last few days have been cold, but, not the coldest. Back when I was 16, in 1996, there was a stretch of days in January that were COLD. The data supports this. First I took all the days with a Low temp of UNDER -35 degrees F.
You can see, there are a bunch of days in Jan/Feb 1996 that were UNDER -35 Degrees F. So then I copied that pivot and expanded on that date range to see all the days. 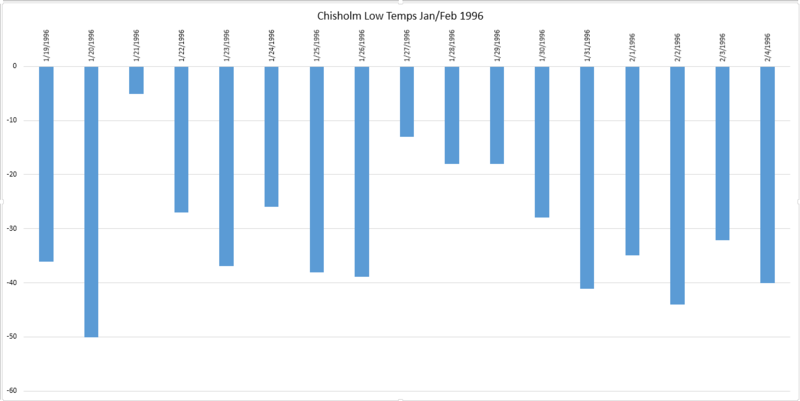 Pretty dang cold from 1/19/1996 to 2/4/1996. Lowest day was -50 Degrees F. Average of -31 Degrees F. Of course these are “real” temps, it was even colder with wind chill. These last 3-4 days of -20 to -40 are cold, but not sure they are colder than in Jan 1996. We will see when it is all said and done.